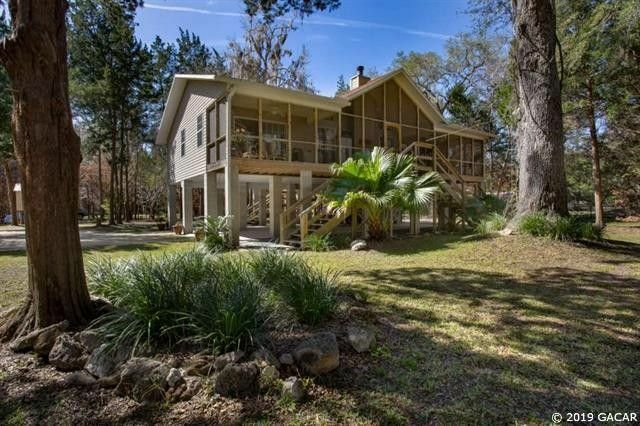 Live the dream life you always wanted here on the river only 15 minutes from downtown High Springs tucked on 5 gorgeous acres on the Santa Fe River between Ginny Springs and Ichetucknee Springs. Located on a paved road, the private driveway is surrounded by enormous live oaks and natural trees throughout the property and leads you to the newly remodeled riverfront home offering you peace and tranquility! Home offers a great open floor plan, solid oak wood floors, marble tile surrounding the wood burning fireplace, lots of windows for natural light and great views from all rooms, pocket doors, vaulted ceilings, solid wood cabinets, walk in closets plus a 400 SF screened porch along the front to relax and enjoy the amazing view of the river.